Are you looking for a perfect birthday gifts for sister, mother, best friend or any other woman who loves cooking and/baking? Every cook needs high quality kitchen gear and she’ll really appreciate your effort to make her meals even more delicious! Of course, you need to find the perfect gift for your important happy hostess first. 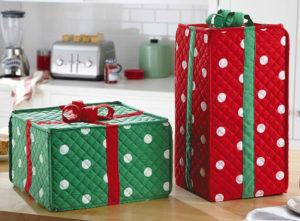 In order to help you, we’ll share 7 gift ideas for cooking lovers with you! 1 – Poweful Blender – Choose a blender that turns ice to slush in a few seconds, the one that will make a smoothie in a snap. Of course, since you’re buying it as a gift, pick the one with a lovely design that will work well with the rest of your friend’s/sister’s/mother’s kitchen. 2 – Waffle Iron – Who doesn’t like delicious waffles? If the person you’re buying a gift already has an old waffle iron, make sure you choose more modern one, with indicator lights which make preparing perfect breakfast easier than ever. 3 – Serving Tray – It’s not only about what you cook, but also how it’s served. Make sure your favorite hostess will have the right serving tray to serve her tasty meals on her next dinner party. Serving trays are perfect for serving appetizers, but make sure the one you choose is easy to wash, clean and maintain. 4 – Tool Sharpener – It’s something everybody needs, especially people who like to cook and bake. Choose a tool sharpener that’s designed to sharpen both serrated and straight blades. 5 – Pie Dish – Pie dishes come in so many sizes and rainbow of colors, and, let’s be honest, they can make pies even more luscious. Plus, they make an ideal gift for bakers. 6 – Cook Book – Just because your mother/sister/friend is an excellent cook, it doesn’t mean she cannot become even better. A good cook book is always a good idea for a gift! 7 – Apron – Aprons are practical, but they can be beautiful and fun too. Choose a lovely designed, high-quality apron for your favorite cook.